We All Scream For- Frozen Non-Dairy Dessert???? Ice cream. Oh we love the stuff! New Zealanders consume the most per year with each person enjoying an average of 28 liters ( a little over 7 gallons) per year. The US is right behind them, consuming an average of 21 liters (around 5 1/2 gallons) per year (source: Business Insider). Even animal lovers who choose not to consume meat may view dairy in a different light. After all, you don’t kill animals to produce milk, do you? Well, not exactly. In order for a cow to produce milk, she must first give birth. Cows are artificially inseminated a little after one year old and first give birth at close to two years. Three days after giving birth, her calf will be taken from her, and they will not be reunited. Her baby will be fed a powdered formula, while the milk she produces for him or her will be sold to make ice cream, yogurt, cheese, and milk. This cow will give birth approximately 4 times, then will be sold for slaughter. If the calf is a girl, she may suffer the same fate as her mother. If it’s a boy, he will either be slaughtered for veal, or slaughtered for beef. So while dairy isn’t made from dead animals, it certainly leads to the death of animals, and a miserable life before that happens. Indeed, mother cows grieve for their calves, and the calves for their mothers. For those of us who want to reduce our intake of dairy, there are some fantastic frozen dessert products out there, including many that are vegan. You can now buy “ice cream” made with soy, rice, almonds, hemp, or coconut. My personal favorite is coconut milk ice cream. 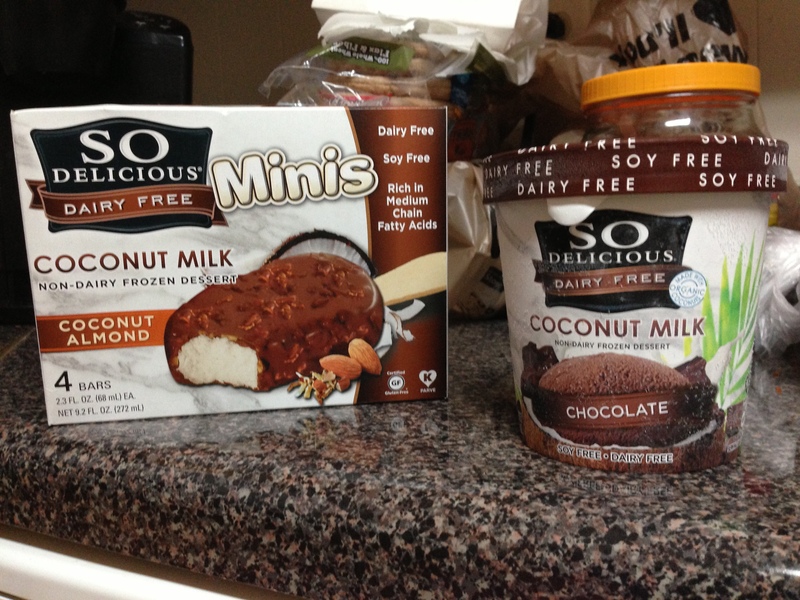 Soy Delicious coconut milk frozen dessert is rich, creamy, and certified vegan! To me, coconut milk frozen treats have a rich, creamy taste with the mouth feel of ice cream. Of course, there’s a one-ingredient frozen treat recipe all over Pinterest that I’ve tried and I love! What? One ingredient? Actually there’s two in this bowl. Slice up bananas and freeze overnight. Put in a blender or food processer and process until cut up. And voila! Frozen dessert! I added blueberries to mine. I’ve also tried strawberries and peanut butter. Note to self: A little peanut butter goes a long way. 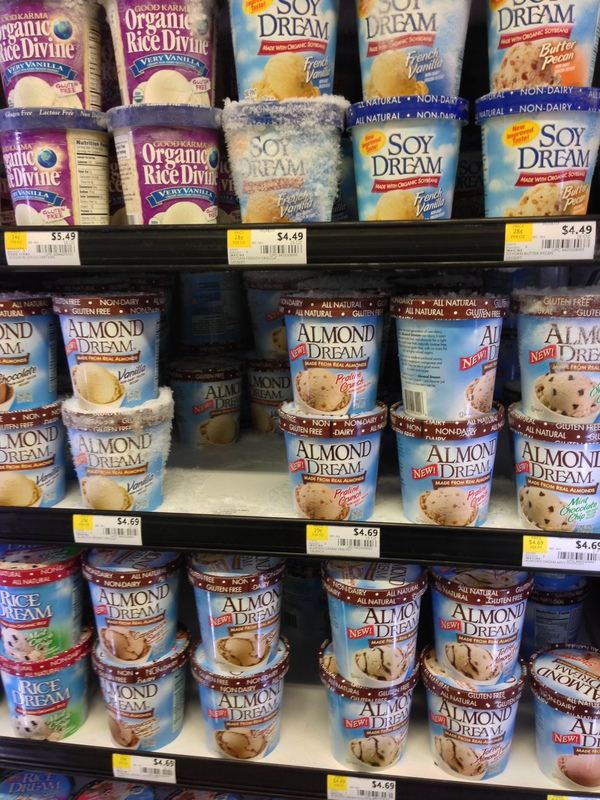 Have you tried any non-dairy frozen dessert treats? Tell us about what you like! PS: Hissy and June Buggie will be here later in the week with Hisses and Purrs. Promise! « DeDe- Listen to Yourself! We didn’t try any non-dairy frozen dessert treats but we love ice-creams! As usual you have posted useful information. I’ll think twice before I buy that orange sherbet that I love so much. The life of the average cow is quite sad. In California they have a commercial that states, “Happy cows make happy cheese.” It’s to boost their cheese industry. I don’t think most cows in California are very happy. I wonder if there are “non-cruel” dairy products available? Does organic cheese, etc. count? 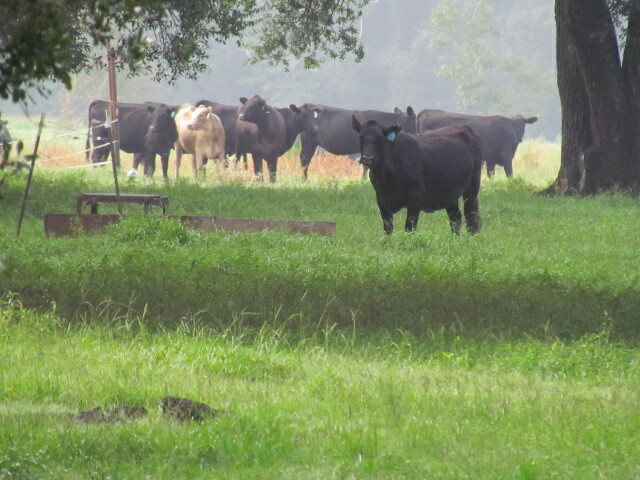 Organic does require humane practices where possible. But that calf will still be taken from its mama. And the SO Delicious brand is sweetened with agave, instead of sugar. Agave is a polysaccharide known as fructosan, which is a non-nutritive, low glycemic sweetener. Your body essentially views it as dietary fiber, rather than sugar. In short, it’s the only ice cream product I can eat. I like that aspect too! I’m a big fan of coconut ice cream but cow milk ice cream upsets my tummy a bit… I’ve found some really good recipes on Pinterest to make my own too! Ooh! Gotta check them out! We loooove ice cream but never seen these non dairy frozen desserts which look very nice and tasty!!!!!! 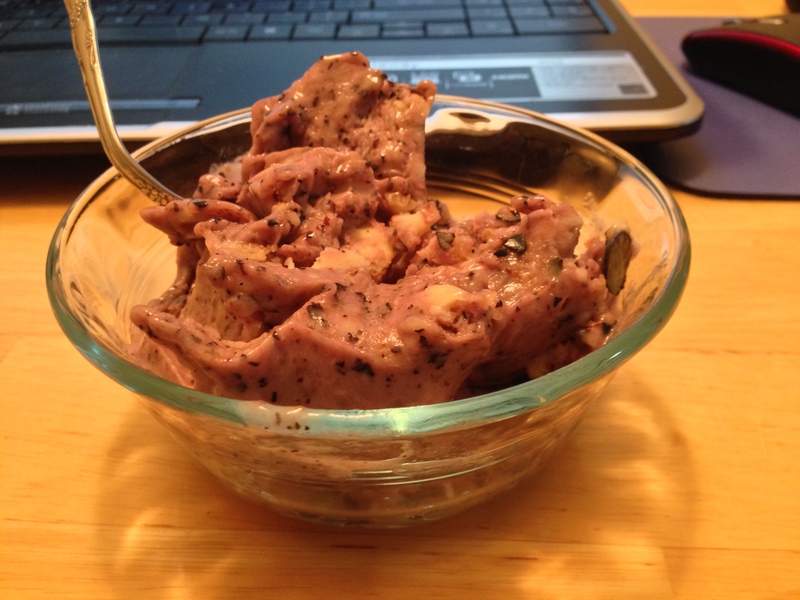 I’ve tried a milkfree ice cream with walnuts and with sweet lupins – it was super tasty! We love the coconut milk minis. Alaska is a huge consumer of Ice cream products…who’d a thunk it? What an informative post!! I (the human) have a gluten and dairy free diet. Finding substitutes is quite hard, especially when sugar intake has to be minimal too! Poor cows. 😦 The coconut milk ice cream sounds delicious! I will definitely look for that the next time I want ice cream. You’re making me drool. I think I’ll send my person to the store now. Oh wow. I feel guilty for all the ice cream I’ve eaten over the years. I had no idea that’s how they treated the cows. 😦 coconut milk sounds like a good substitute for ice cream. Thank you for sharing. Those are what we eat at my house. I like the almond stuff better than the rice, but it’s all good. NOT around here! You would like our farms. 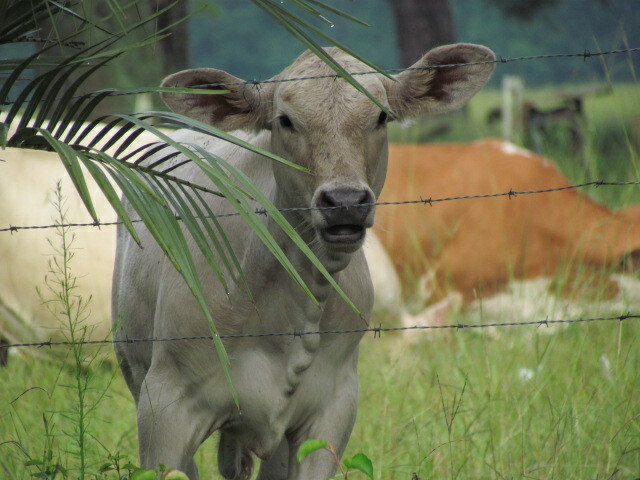 We are just starting to get more coconut products here Rumpy…I am busting to try the coconut yoghurt.